Our battle with the mysterious poo-ing animal rages on. 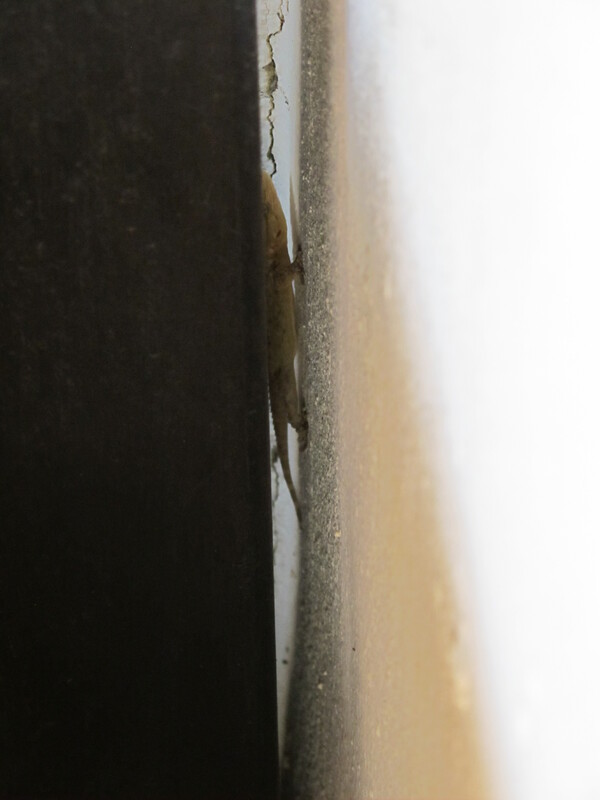 The previously mentioned tactic of chicken wire and sharp nails had absolutely no effect, so they have been removed. The animal now perches on the pillar and simply poos onto the tiles beside the pool. 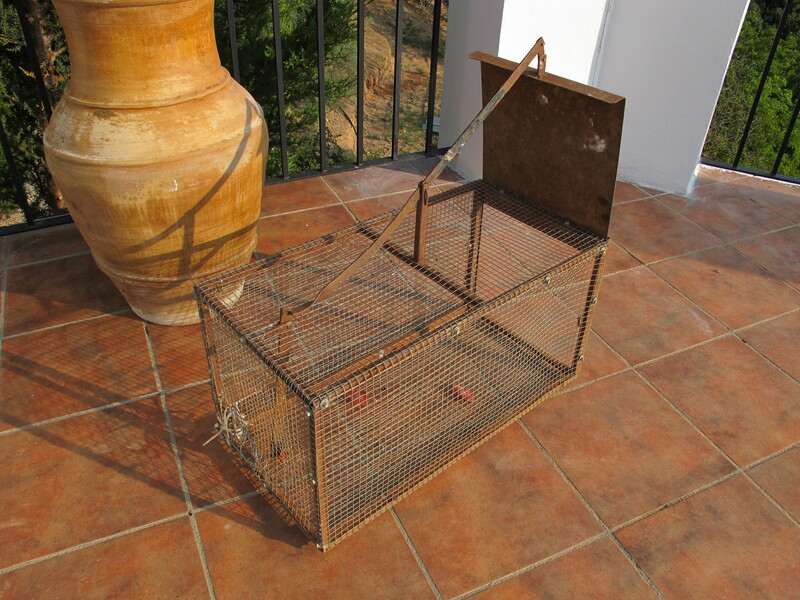 Dramatic action is called for, so now we have a baited trap, a trampa supplied by Pablo. 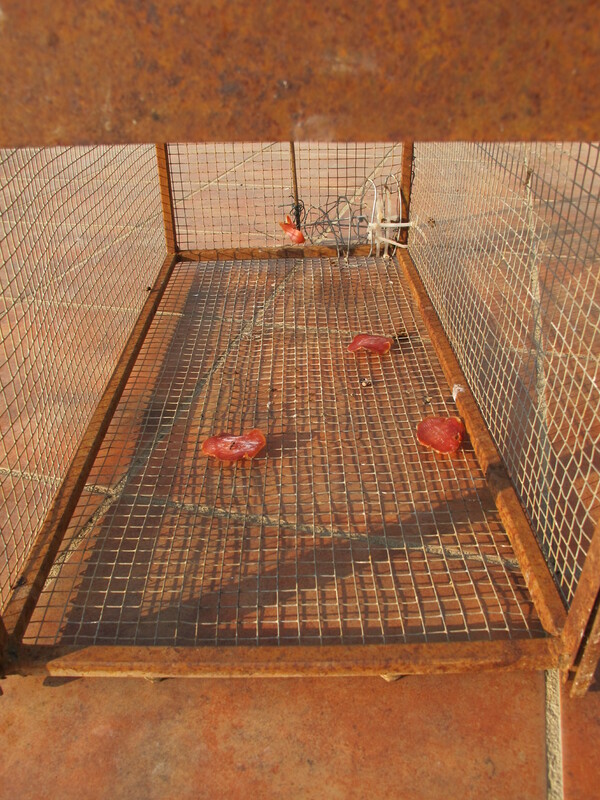 A basic metal cage with a trap door connected to a hook on which is balanced a piece of meat. Pablo recommended chorizo. The chorizo was ignored and began to smell, so was replaced by ham. The ham was eaten by Pablo’s Alsation puppy Perrita – this means ‘little dog’, the Spanish being unimaginative with animal names. Perrita’s mother is called Lopina, ‘she-wolf’. Anyway, back to the trampa. At the same time as our poo problem, still suspected of being a stone marten, Pablo was having his own problem with an animal eating his hens at night. He bated his trap with chorizo, it was not eaten. So one night last week he stayed awake and sat by the open bathroom window, his shotgun aimed at the chicken run. The culprit is now dead, a wild cat, a huge wild tabby cat not a lynx or anything exciting. Now as our trampa remains empty, we wonder if the same huge cat is responsible for our poo. At the same time as this has been going on, we have been plagued with dirty paw prints left overnight on the garden sofa cushions we have been lazy enough to leave out. We’ve tried piling the cushions up, but the cat/cats just knock them down into a cosy bed for the night. The cushion covers are washable, but it is becoming too regular a chore. We got excited that Pablo’s huge cat could be the owner of the paw prints, and our double problem was solved. In the countryside it is common to see once-domesticated cats and dogs roaming wild and reproducing, they can be a real nuisance. Unfortunately last night we left out our sofa cushions as a test, and yes there were muddied paw prints this morning. So tonight we will set up the trampa with chorizo and place it beside the sofa cushions. This entry was posted in Just Living and tagged Andalucia, nature, Sandra Danby, Spain, Spanish countryside, wildlife in Spain on July 1, 2013 by sandradan1.